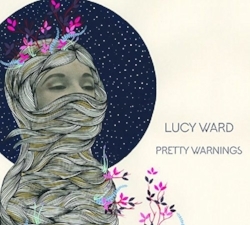 Pretty Warnings is the captivating fourth studio album from multi award winning Derbyshire singer-songwriter Lucy Ward. Rich with traditional folk and self penned original songs, this album explores matters of love, darkness, longing and joy. While Lucy’s previous albums dealt with larger more sweeping themes. With Lucy now married with a small child, Pretty Warnings seems more intimate and personal. Lucy’s ability to inhabit the very heart of a song is bewitching and very beautiful. She is an excellent storyteller concerned with expressing truth and the exploring the human condition in all its facets. Lucy creates rich soundscapes, painting a vivid picture with her lyrics. The new album is an expressive collection of true stories and evocative imagery produced by the very talented Stu Hanna (Megson) & Stephen MacLachlan. As well as innovative arrangements of traditional songs such as the ballad ‘Bill Norrie’, Lucy has delved into the folk tradition further to come up with beautiful retellings of traditional songs. ‘The Cruel Mother’ is the basis of her song Mari Fach (meaning ‘Sweet Mari’), the true story of a young welsh woman pregnant, unmarried and afraid. The archetypal rover becomes Lucy’s yearning ‘Silver Morning’, a wonderful taste of her originality. She has also addressed the recurring theme of the night visitor with the insistent ‘Cold Caller’. Pretty Warnings has a sublime quality, a real enchanting warmth runs through the album. Lucy’s songwriting has evolved with a new richness born from her new life experiences and time away from both touring and the studio. Songs like ‘Sunshine Child’ and ‘The Sweetest Flowers’ being excellent examples.